the private sector as a whole has not yet recovered all the jobs it has lost since 2008. This is not an economy that can bear a higher tax burden. I also noted that a review of wage trends would shed more definitive light on where our state's economy is heading. Let us therefore add that piece to the puzzle. Unlike the overall trend in jobs, nominal wages have actually caught up, even risen above where they were ten years ago. However, the recovery in pay has not exactly been impressive: so far in 2018, average weekly earnings for the private sector as a whole are $1.15 in 2018 for every $1.00 earned in 2008. In other words, in ten years the average increase in weekly wages has been 15 percent. That is not even enough to keep up with inflation. 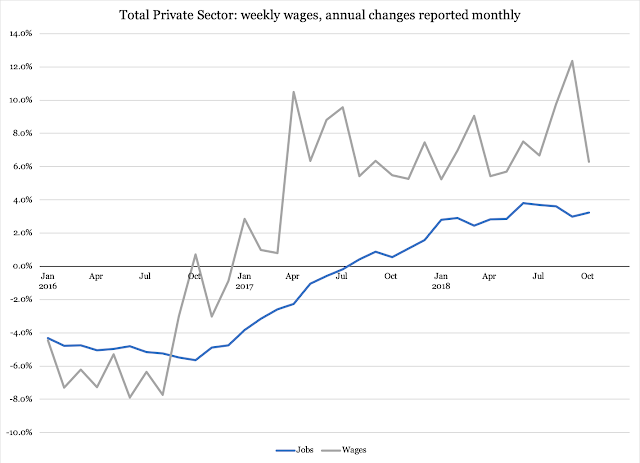 For comparison, the national average weekly private-sector wage so far in 2018 is $1.26 per $1.00 in 2008. 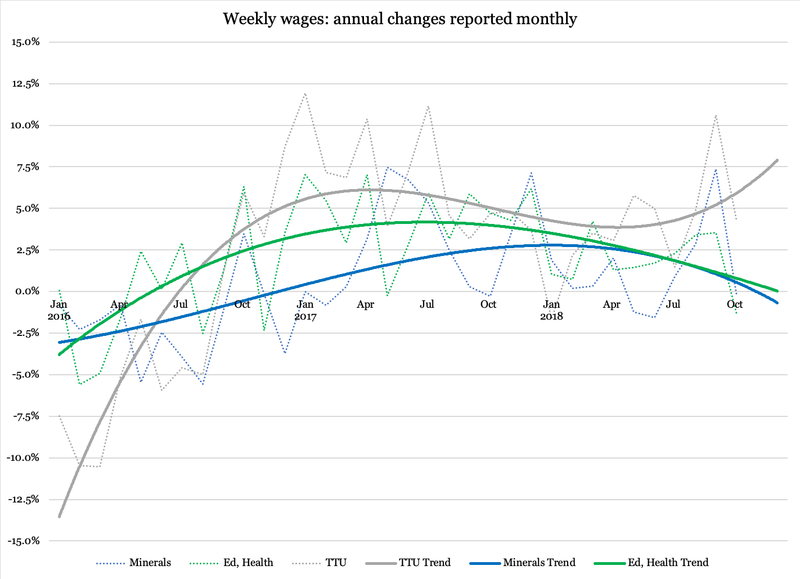 Average weekly earnings are not reported with the same industrial detail as jobs, so we cannot immediately compare jobs in infrastructure operations (TWU) from yesterday's article with the TTU trend here. 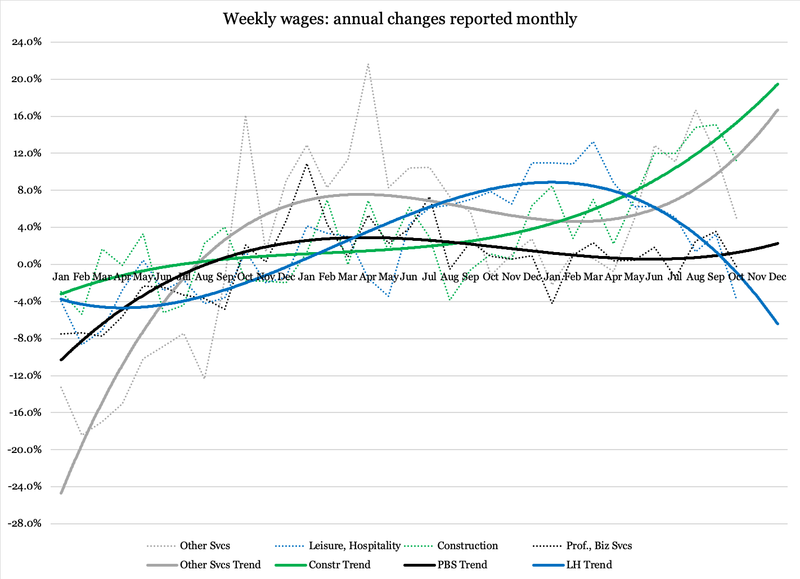 However, with the necessary caveat for approximations, the combined jobs-and-wages trend for trade and infrastructure is the strongest of all industries in our state. Even though the wages in this industry are only eight percent above their 2008 levels, that trend is among the most consistent, as is its jobs trend. By contrast, Education and Health appears to be stagnating. Normally, the health-care part of this industrial category is reliable when it comes to jobs and earnings, but after a relatively brief trend of strength in the past year, its overall performance is now below state average. Professional and Business Services had the worst jobs growth in October (-2.1 percent) and a small decline in year-over-year weekly earnings. Taken together, these two numbers send a signal worth taking seriously. Since this industry includes consultants critical to the ups and downs of private businesses, its performance is a good indicator of how the economy can be expected to perform in the near future. The recent weakening in Professional and Business Services is a signal that we are past the peak of our brief growth cycle. Despite a mixed picture for the rest of the private sector that would moderate any predictions, I expect the third-quarter GDP growth number for Wyoming to be slightly negative. We will not have those numbers until January 21, but the December 20 release of state-level personal income for the third quarter will give us a good hint of what is to come.